Before we can dive into all the fun new features, it’s important to cover the API changes that hit the platform in 2018. Earlier this year, Facebook and Instagram made major changes to their APIs in an effort to protect your data and privacy, and nearly every company that does business on Instagram was affected by these changes. If you use any apps connected to Instagram, you probably noticed a few changes — and some of your apps may have stopped working altogether! Instagram bots are officially dead. If you were using any bots to follow and unfollow accounts or like Instagram posts for you, they’ve most likely stopped working. Your Instagram “likes” are now private, meaning other companies won’t be able to tell what posts you’ve liked or not. This mainly affected shopping apps that kept track of your interests were based on your Instagram activity. Apps that help you analyze your Instagram followers, or someone else’s followers, no longer work. This includes any apps that showed when someone unfollowed you. If you’re using an app to search for user-generated content (UGC) on Instagram (like Later’s Search & Repost feature), it’s capabilities will be a bit more limited. Since Instagram likes are now private, you can now only search for UGC by hashtag. You will no longer be able to post or delete comments from anywhere except with Instagram with a personal account. This means f you want to use community management features like Later’s Conversations, you’ll need to switch to an Instagram business profile. Check out our post, The Instagram API is Changing: Here’s What It Means for You to learn more! One of the most exciting Instagram updates this year was the ability to automatically schedule Instagram posts! This was also a result of the changes to the API, giving Instagram business profiles the ability to schedule single photo posts to Instagram without the use of push notifications. Now you don’t have to interrupt your busy work day or stop what you’re doing to post to Instagram, just schedule your posts and let us do the rest! Note: The Instagram API limits auto publishing to single photo posts only, which means that Carousel or video posts will still need to use Later’s “notifications” publishing method. Need help setting up your Later account for auto publishing to Instagram? Check out our step-by-step help guide here! The new Instagram algorithm has arrived and Instagram is finally shedding light on how the algorithm chooses what photos and videos show up in your feed! As we explained in our recent post, the Instagram algorithm tries to predict what photos and videos are most important to you, and uses three main factors to determine this: interest, timeliness, and relationship. 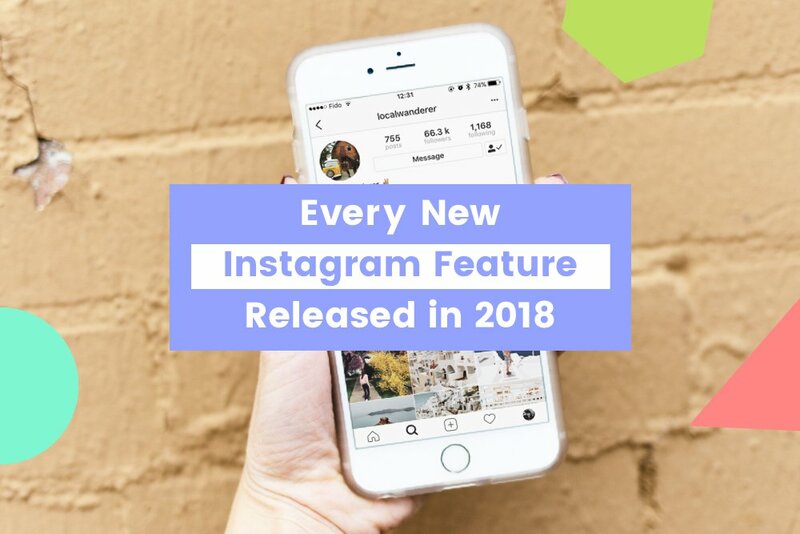 Instagram also use frequency, following, and usage as factors to determine what content is delivered to your feed, adding to their efforts to show you more of what matters most. Check out The New Instagram Algorithm Has Arrived – Here’s How it Works to learn more about the latest algorithm change and how it will affect your Instagram marketing strategy! Last month, Instagram introduced a new “mute” feature that lets you mute posts from accounts you follow without having to actually unfollow those accounts. This feature gives users way more control over the content they see in their feed, which is obviously a big priority for Instagram in 2018.